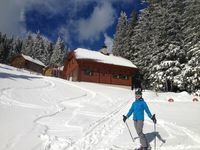 Property 9: Almrauschhütte - Arrive and forget about everyday life! Relaxation oasis on Klippitztörl !! Property 43: Relaxation oasis on Klippitztörl !! Magnificently located chalet, directly on the forest's edge. 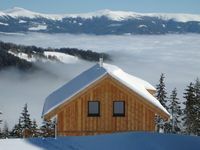 Property 48: Magnificently located chalet, directly on the forest's edge. A wonderful chalet! Ski in ski out and a beautiful view! We really enjoyed the stay. The pick up and drop off of all the luggage to the house and back to the parking when we left was really well organized. The house was spacious with a big refrigerator. It was very warm when we arrived so we put of all the heaters. The bedrooms were al very spacious with cupboards with enough room. A nice sauna, but to use it you have to put it on early. It takes more then an hour to heat up. The downside of the house is the water pressure. You can only take a shower with one person at a time. But we managed to do that without a problem and we were with 12. The walls are very thin so bring some earplugs if you have snoring housemates. And a little note from our teenagers, they missed the Wi-Fi, but it depends if one finds that a downside or not. All in all we had a great time and we would love to come back someday! Thank you Ingrid for the hospitality and the nice contact during our stay! Der Chalet hat uns sehr gefallen. Neu, perfekt ausgestattet und vor allem f&uuml;r einen Familien-Ski-Urlaub sehr gut vorbereitet (geheizter Skischuhhalter, Helmketten, Platz f&uuml;r Handyladenger&auml;te, Playstation f&uuml;r Kinder, usw.). Wirklich hat jemand daran gedacht, was die G&auml;ste &uuml;blicherweise machen, was sie brauchen. Wir haben den Urlaub sehr genossen!